Philippine President Rodrigo Duterte vows cooperation with Israel's largest emergency first response organization. On Tuesday, the President of the Philippines, Ridrigo Duterte, visited the headquarters of Magen David Adom (MDA), Israel's largest emergency medical first response group, in Jerusalem as part of his visit to Israel. During his visit, the President joined MDA Director-General Eli Bin to tour MDA's Dispatch 101 call center in the Jerusalem region and even witnessed a drill of a mass casualty event and the operational activities of MDA. “As part of the close cooperation between MDA and the Philippine Red Cross, we are delighted to donate our extensive knowledge and experience and welcome the President’s visit to MDA – Israel’s National Rescue Organization," said MDA Director General Eli Bin. It is not coincidental that the President of the Philippines requested a visit to the MDA during his visit to Israel, since the MDA and the Philippine Red Cross have been working closely together since Typhoon Haiyan (Yolanda) struck the Philippines five years ago. As part of this cooperation, MDA personnel have trained Filipino Red Cross personnel on the Israeli model of emergency medicine medics, certifying them as medical instructors and teaching them how the MDA copes with mass casualty events. 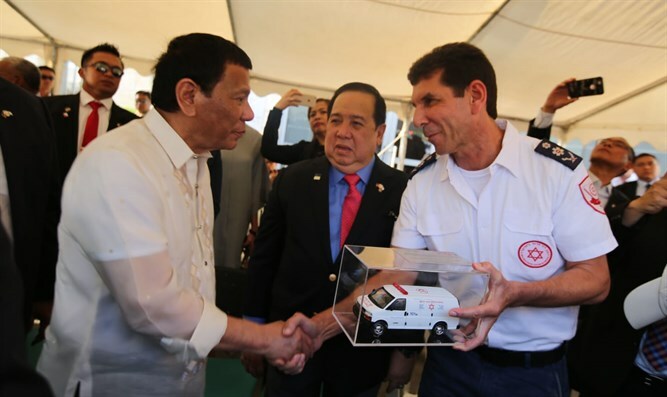 As noted, during his visit to the MDA President Duterta learned about the MDA’s control and command system, which plays a significant part of MDA's cooperation with the Philippine Red Cross. This past May, the chairman of the Philippine Red Cross, Senator Richard Gordon, visited MDA during his visit. He asked MDA for assistance in implementing the unique control and control system developed by MDA throughout the Philippines. The system is currently being integrated in the Philippine Red Army headquarters, providing a response regarding the availability of rescue vehicles and the resources available to respond to the event, the activation of the community on call staff and the management of the operational response, including the possibility of the organization's managers to monitor the activity, especially in the event of a mass casualty event. MDA is making the necessary adjustments to facilitate the integration of the system in the Philippines. The MDA system is expected to be active and operational in the greater Manila area that covers 24 million residents by the end of November. The President also showed interest responses to a mass casualty event and on the treatment of victims of terrorist attacks. Prior to the cooperation with MDA, the Philippines had no organized doctrine for responding to a mass casualty event, and no doctrine regarding collaborate efforts of all rescue forces at the scene. The MDA team presented to the President the MDA response during the first minutes of a terrorist attack, and particularly arena management, collaborative work with the police sappers, triage, treatment and rapid removal of victims from the scene of the attack, in order to allow other security forces to perform their job. President Duterte was extremely impressed by MDA's modus operandi. "For five years, MDA and the Philippine Red Cross have been working together to save lives," Said Bin. "Magen David Adom as the Israeli Red Cross and as Israel’s national rescue organization of the country not only contributes greatly to the countries around the world from the vast knowledge and experience it has accumulated, but also learns and acquires knowledge from countries that are thoroughly familiar with coping with natural disasters such as the Philippines. I would like to take this opportunity to thank the President of the Philippines, Mr. Rodrigo Duterte, who took time from his visit to Israel to visit the MDA, to Senator Richard Gordon and to the other distinguished members of the delegation who came to witness up close the fruitful cooperation that will continue between the MDA and the Philippine Red Cross. I have no doubt that the visit will further reinforce the strong ties between the two organizations that saves many lives in Israel and around the world."